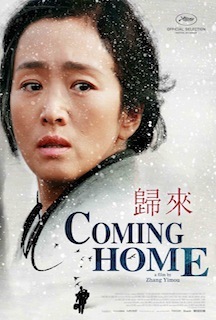 Movie Review: 28 years have passed since the first collaboration between the awarded Chinese filmmaker, Zhang Yimou, and the renowned actress, Gong Li. That first movie was “Red Sorghum” - not really one of my favorites - and their successful association would become stronger in subsequent essential dramas, all of them from the 90’s, cases of “Ju Dou”, “Raise the Red Lantern”, “The Story of Qiu Ju”, “To Live”, and “Shanghai Triad”. Now, they reunite one more time in “Coming Home”, eight years after “The Curse of the Golden Flower”, an adventurous action epic from 2007. Gong Li plays Yu Feng, a wife and former teacher whose husband, Lu Yanshi (Daoming Chen), also a professor, was arrested for political reasons and sent to a labor camp during the Cultural Revolution. Their teenage daughter, Dandan (Huiwen Zhang), an extremely skillful ballerina, was refused the leading role in the famous ballet ‘Red Detachment of Women’ because her father was considered an outlaw. She grew up resentful with this setback, choosing to denounce her father when he attempts to approach Yu after managing to escape the camp where he was confined. A few years later, the Cultural Revolution is over and Lu is finally released. However, he realizes that everything has changed during all those years. Dandan currently lives in the dormitory of the old textile factory where she’s working and is now regretful about her actions. In turn, Yu reacts in a distant way and doesn't seem to care anymore, not because she has stopped loving him, but because she’s unable to recognize him due to suffering from a traumatic amnesia. Not so striking as other dramatic voyages of Mr. Yimou, the relentlessly grievous “Coming Home” still is a copious improvement when compared with the contrived “The Flowers of War”, a reenactment of a Japan’s Nanking incident, in which starred Christian Bale and Ni Ni. Despite the tenacious melodramatic tones, a beneficial aspect is that the script, adapted by Jingzhi Zou from the novel ‘The Criminal Lu Yanshi’ by Geling Yan, doesn’t take us to the most obvious places. A magnetic photography, painted with rich colors, together with the solid production values, do the rest.